Vera Greutink is a permaculture gardener, teacher and designer based in the Netherlands. She’s been gardening for over 30 years during which she has created many beautiful and productive gardens. 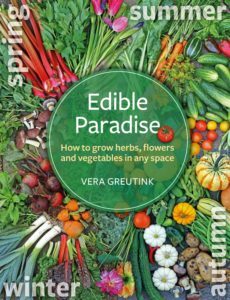 Vera regularly contributes to Dutch and Belgian gardening magazines as well as the English Permaculture Magazine . She is also Editor in Chief of the edible gardening magazine, De Tuin op Tafel (The Garden on the Table). To see what’s new at her 1/4 acre permaculture plot, you can follow her on Instagram or on YouTube (both as GrownToCook). Vera shares how to create a beautiful and productive organic garden using flowers, herbs and vegetables. There’s advice for container gardening and a monthly job guide.